El Relicario del Carmen is in the Colonial Old City of Quito, in a truly historic house, dating back to 1705; a boutique three star hotel with 18 comfortable rooms on four floors. It has been beautifully renovated with great emphasis on the original details but with all the modern comforts including a central air-conditioning system. The furniture is handmade by recognized Ecuadorian artisans and original paintings decorate public and private areas. 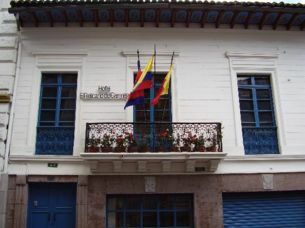 It is located a block away from the main square 'Plaza de la Independencia' and the Government Palace, right in the heart of Quito, Ecuador's capital. This Colonial house, converted into a comfortable hotel, is basic and simple, but with the charm of Quito's architecture and artisans' decorations. El Relicario del Carmen offers personalized service and a superb location for those who want a taste of the local atmosphere. Hotel amenities include room service, wireless internet in all hotel areas, one computer terminal with internet for guest use, laundry service and reading room. The small restaurant 'Los Guacamayos' offers local and Italian-style food and is open from 7:30 AM to 9:30 PM. The rooms all include central air-conditioning, cable TVs, alarm clock radios, in-room safe-deposit boxes, shower bathrooms with hair dryers and amenity kits.